Thanks to all who continue to send us feedback on the WhatsApp Product Support channels. Through these channels, SAP customers receive updates on only the products that apply to their needs. Please see our new page listing all the new channels on the Support Portal. 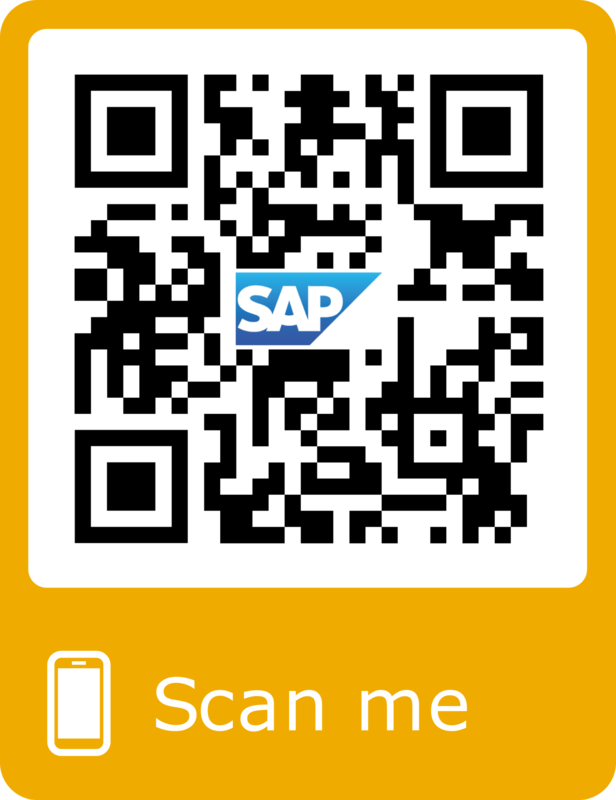 Subscribe to the channel you need to receive messages including KBAs, wikis, guided answers, notes and “hot tips” from SAP Product Support. Use the steps below to subscribe to a channel today. Use these quick, easy steps to subscribe and choose your topics. From your mobile device, click on the WhatsApp links listed above to access the WhatsApp widget. Click the green button. 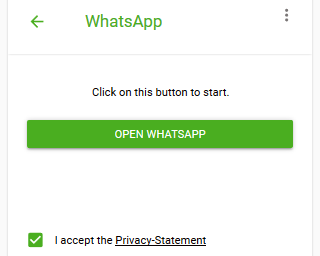 Click on the green button after you have accepted the privacy statement. Follow the prompt to send a message. Click on the link to access the product category menu. Choose your topics. Access this list to change your topics at any time. Note: Product Support doesn’t respond to questions on this broadcast list. Please use other SAP Support chat tools for general questions like CIC Chat or Expert Chat for assistance. 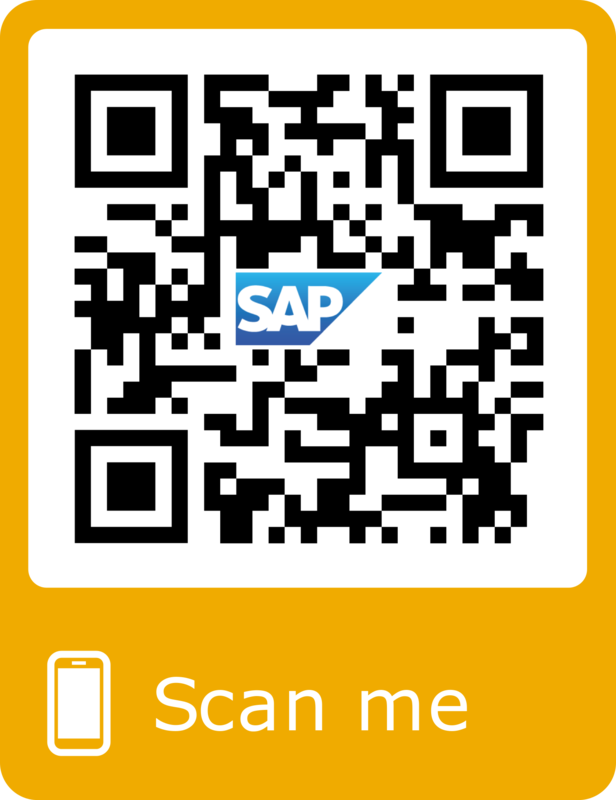 Share your feedback here and tell us what other SAP products and topics you would like to see added. Thanks for the information, Lisa! You might want to add a secondary tag for SAP Netweaver, so that Basis folks on SCN could see this too. And maybe include ABAP Development as well to spread the word. I don’t use whatsapp, is there an alternative way to get those Information, e.g. a Website, a RSS-Feed or some Twitter-Accounts? Hello Joachim, Great question, yes, you can follow @SAPSupportHelp account where we post KBAs and helpful tips. We also have the @SAPCloudSupport account where SuccessFactors KBAs are posted. it would be very helpful to have a QR Code for the first link so that one can scan it from his/her mobile. is there any groups planned for future having different module updates through it like functional modules? We’ll take your feedback into consideration as we roll out new channels. Good to know! Hi Lisa, will there be anything coming soon for CEC solutions? We are open to all suggestions. Are there specific CEC topics you’re interested in? Thanks Lisa for sharing very useful details. You’re very welcome! Good to hear this is helpful. Could a similar arrangement be made to push these support, KBA messages through WeChat ? In mainland China and Chinese speaking world, WeChat is the de facto messaging platform used. 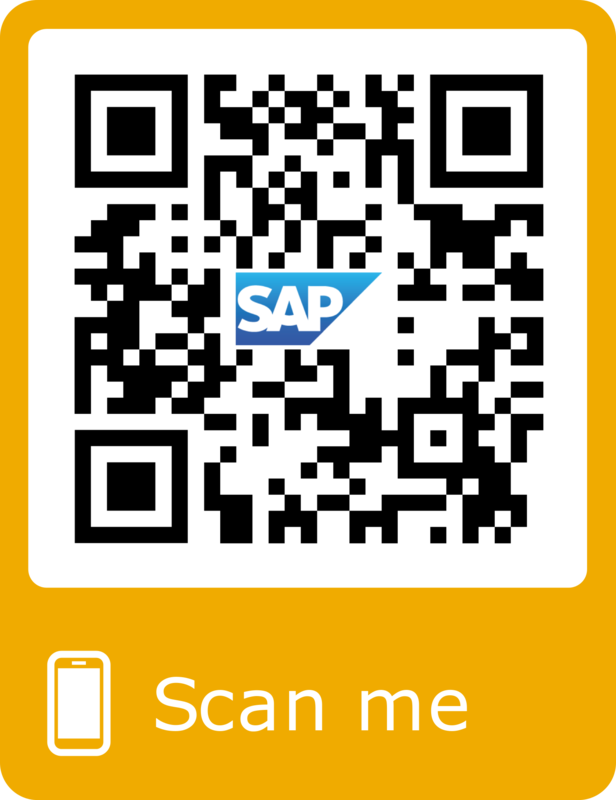 Hello Gregg, SAP Product Support posts articles to WeChat SAP Daily right now. We are exploring other WeChat functions that may be useful for customer support. More to follow here. I have shared this blog to each and everyone. once again thanking you for this great work. Thank you Shivakkumar, This is very helpful. Is there any option available for the subscribers to share their feedback on this tool? 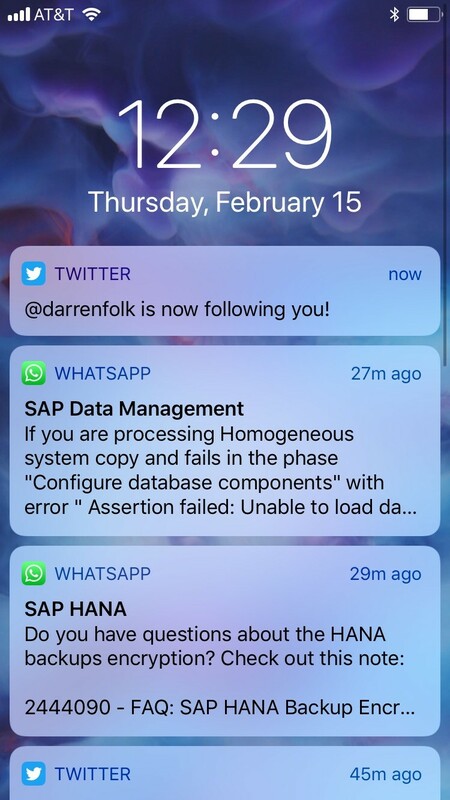 Is there any wiki similar to https://wiki.scn.sap.com/wiki/display/SAPHANA/SAP+HANA+WhatsApp+Broadcast+History for other whatsapp channels? Reg;- Whatsapp channel for sap EWM/WM/MM/PP/SD/sap S/4HANA EM..etc..
Can you please intiate to create whatsapp broadcast for SAP EWM, S/4HANA Enterprise management, SAP WM, SAP SD, SAP PP..etc.. it is more useful to the logistics consultants.. Thanks Lisa for the help and information. If we have latest news, updates on SAP action towards SAP EWM, S/4HANA Enterprise management, SAP WM, SAP SD, SAP PP, MM. PM, QM, APO, GTS, SNP, SNC, SRM, ARIBA.. etc..I mean new features and Innovations..etc and then lastest update on SAP Notes..and also SAP Success stories during implementation, roll-out or upgrade in client place..etc.. it will be more useful to all consultants..
Is it possible to create for Hybris? Thanks to you and your team for all the efforts in making these so easily accessible. Any plans of starting channel for Fiori? Thanks for your request. We will take this into consideration for future channels. Is there any legal considerations regarding the corporate use of WhatsApp? Hello Amani, Are you asking about SAP corporate use? yes exactly, if there are any impacts on customers making use of the sap support service via WA? Can we have the near feature release S/4HANA innovations relevant updates under the title “S/4HANA” ? 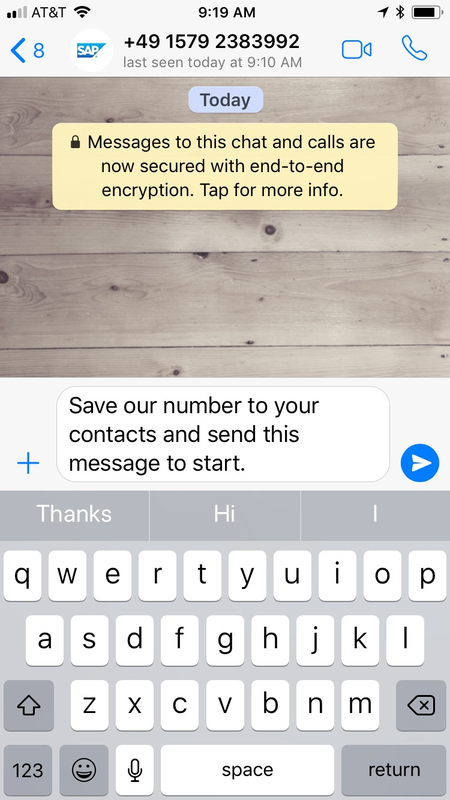 Are we having any “User Experience” whatsapp number for FIORI/UI5? Can we have the forthcoming “event” updates irrespective of the geography? Can we have the Localization specific updates so that we can get country specific localization updates? e.g., GST in India. 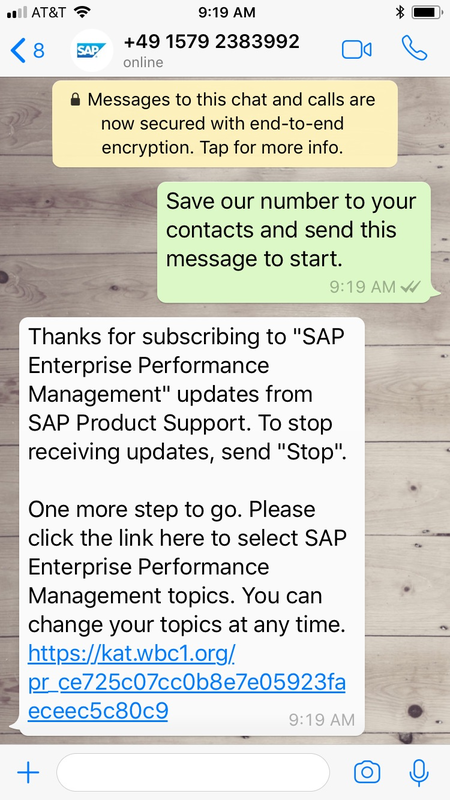 Are we having SAP products specific whatsapp number? Unfortunately, our resources are limited at this time. Thank you for your list of ideas! Please see the new landing page for details at https://support.sap.com/en/my-support/incidents/whatsapp.html. Thanks for the valid info. Started using those whatsapp numbers. Thanks for the blog and it is extremely useful. 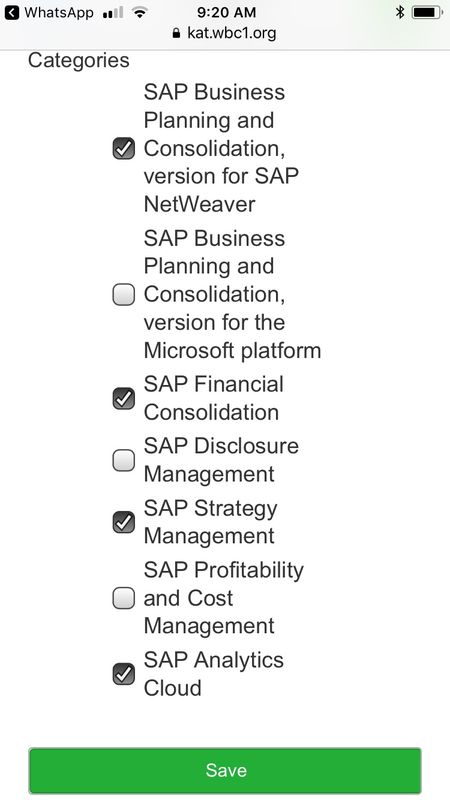 Do we have anything for SAP BW, I can see different areas but not SAP BW? Any plans for SAP BW? Please let me know if information that can be helpful to me. No channel for SAP BW but thank you for your feedback. Good to know there is interest for certain product areas. dont you have one for sap ewm ?